To locate the Producer Handbook, click here. We live in the digital age. The quality of digital video recordings and playback equipment and the convenience of non-linear digital editing have revolutionized the video industry. As new technologies have taken over, older technologies have become obsolete – e.g. DVDs have replaced VHS tapes. Today, unless you are watching a live program on CTV, you are actually watching a digital MPEG-2 file that is being played on a computer. There are no tapes playing in a tape player or discs spinning in a disc player – just computer files being played from a big computer hard drive. Community residents can submit finished programs created using their own equipment with no CTV training at all. Others who wish to create programs using CTV equipment may do so after they have completed appropriate production training workshops. Workshops can include any combination of the following: Studio Production, Portable Equipment, Digital Editing. For remote shoots, CTV provides the use of digital video cameras, microphones and portable lighting kits. Using CTV’s digital editing software, video can be transferred from almost any format for editing. It can then be edited into clips; clips can be joined using transitions; and background effects can be added. STUDIO Production Training . . .
CTV offers fully equipped TV studios with ample space for interview formats, multiple robotic cameras, cool videssence lighting, and professional audio mixing boards. Each studio is also equipped with software that allows producers to create network style virtual sets with integrated character graphics. 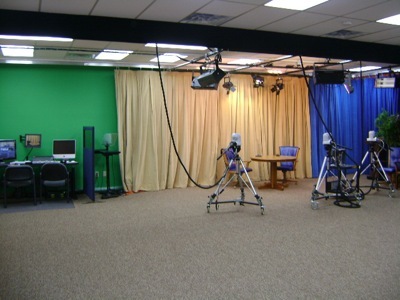 One studio is also equipped with audio conferencing equipment allowing telephone callers to interact over the air during live cablecast programs. Because multiple positions must be taught in Studio Workshops, they must be taught among groups of three or more participants. Producers wishing to schedule a Studio Workshop are responsible for recruiting participants for their workshop. The pace of the training and the number of training sessions is determined by the familiarity and comfort level of the group. Topics covered during the workshop include: camera demonstration, interview techniques, microphones, camera switching, special effects, subtitles, rolls & crawls, hands-on practice, and self-critique. PORTABLE EQUIPMENT Training . . .
Community Television provides access to field production equipment such as lights, microphones, tripods, and, of course, professional quality camcorders. That equipment has been upgraded and updated several times over the years to coincide with the newest available technology. The latest addition to our staple of professional gear is the Panasonic HMC-40. The HMC-40 is a compact, professional quality camcorder that gives producers like you the flexibility to do many types of productions. It’s also very easy to use, so you can get started right away. All you have to do is take our portable camera workshop to get certified to use our equipment. CTV offers a certification workshop to members of the community who would like to use the Canon XL-1 to produce their own programming for the station. 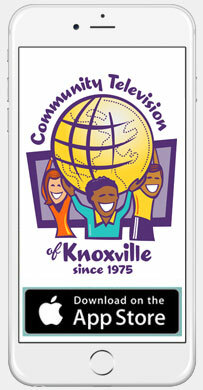 The camera is available to anyone who lives in Knox County, pays the annual video access fee, signs a producer agreement form, and completes the portable training workshop taught by the CTV staff. After certification, producers can check out the camera and its accessories to do field shooting within the city of Knoxville. The workshop covers the basic operation of the Panasonic HMC-40 camcorder, how to use external microphones, when to use a tripod and the importance of lighting. We also outline CTV’s rules and procedures so that you know how to correctly reserve, check out, and use our camera equipment. Because of the need for “on-camera” and “off-camera” participants, Portable Equipment Workshops are usually taught among groups with three or more participants. The pace of the training and the number of training sessions is determined by the familiarity and comfort level of the group. Classes are scheduled at the beginning of each month and meet once a week for up to four weeks. If you would like to take our portable camera workshop, stop by our studios or call (865) 215-8848 to set up an appointment today! VIDEO EDITING Training . . .
CTV offers editing suites equipped with digital software allowing producers to transfer their raw footage and transform it into finished programs. In order to use CTV’s editing facilities, community residents must first take an editing workshop to learn how to use our equipment. Editing workshops are usually taught one-on-one. The pace of the training is determined by the familiarity and comfort level of each participant. Currently, CTV staff train producers to use Apple’s iMovie software. Apple also has an excellent tutorial on their website that will you show you all you need to know in order to use their editing software. Please take a look at this video guide in order to familiarize yourself with iMovie and then contact CTV to complete your workshop so you can become certified to use our facilities to edit your show.